Articles about photography, photo book creation and creative gift ideas. Ferrero® and kinder® Chocolate Advent calendars with a difference - Presse-Blog on Creative gift ideas trump spending power this Christmas! Ferrero® and kinder® Chocolate Advent calendars with a difference – Presseengel.de on Creative gift ideas trump spending power this Christmas! FotoInsight® now offers the popular photo Advent calendars in portrait format – Daily Gazette on Creative gift ideas trump spending power this Christmas! Ferrero® and kinder® chocolate Advent calendars with own pictures – Presseengel.de on Creative gift ideas trump spending power this Christmas! In this tutorial you will learn how to design a 12 month wall calendar with your own pictures. If you have at least twelve images you want to show throughout the year, a wall calendar is ideal and quick to prepare, following these few, really easy steps. 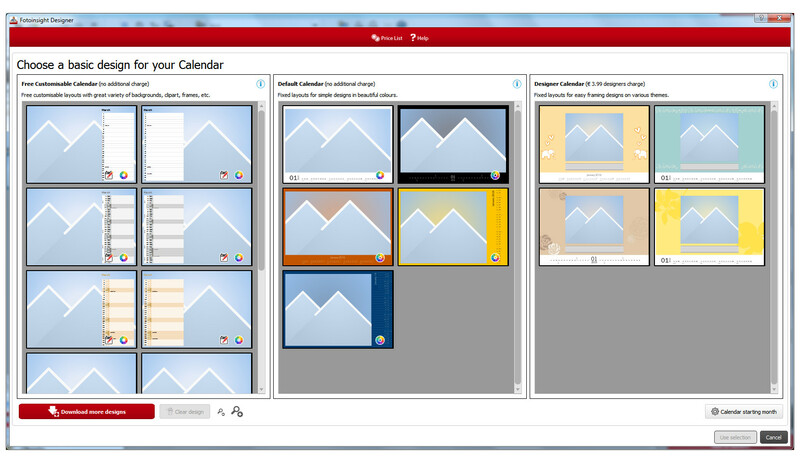 To make your own photo calendar, download free Designer software from an online photo printing lab, like e.g. FotoInsight, whose photo calendar quality has been lauded in many reviews across the UK, Ireland and Europe. The free Designer app is available for Microsoft Windows, MacOS X, Linux as well as the iPhone/iPad and Android. After installing the application and starting it, you simply choose the print product you want to create (i.e. photo calendars). 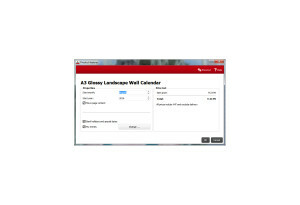 There is a range of wall calendars in portrait, landscape and square format and in different sizes. To pick a suitable format, you should check the direction and shape of the pictures you want to use and the space where you plan to hang the wall calendar. Different photo labs use different paper qualities. 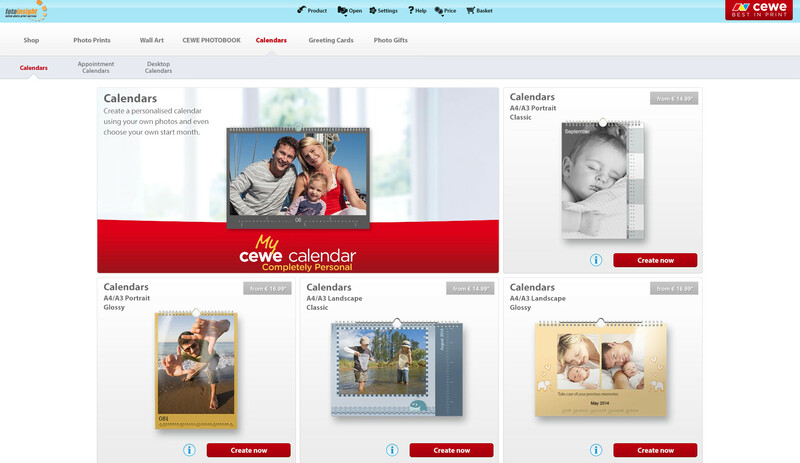 CEWE Calendars are all made on quality cardstock, using digital print at 300dpi or special photo paper. The paper can be prepared with a glossy or matt finish, where again, the wall calendar’s location will play a role. For example a high-gloss finish, popular for its radiant elegance, will display more reflections. Processed photo paper is more radiant than direct print, so that even a matt finish photo paper will provide brilliant colours. Photo paper also feels stronger, though if hung over a stream of hot air, like above a radiator, it tends bend a little, as it is composed of layers with different thermal properties. The photo-chemical exposure on photographic paper reproduces balanced colours with sharper detail, with no noise from print dots, not even under a magnifying glass. What is your calendar for? If the calendar is for example for a birthday present it could start the month of the birthday? Bespoke calendars can also follow a twelve month school or academic year or start on any other month of the year. To change calendar features like the starting month click on the “tools” in the top left corner of the software interface. 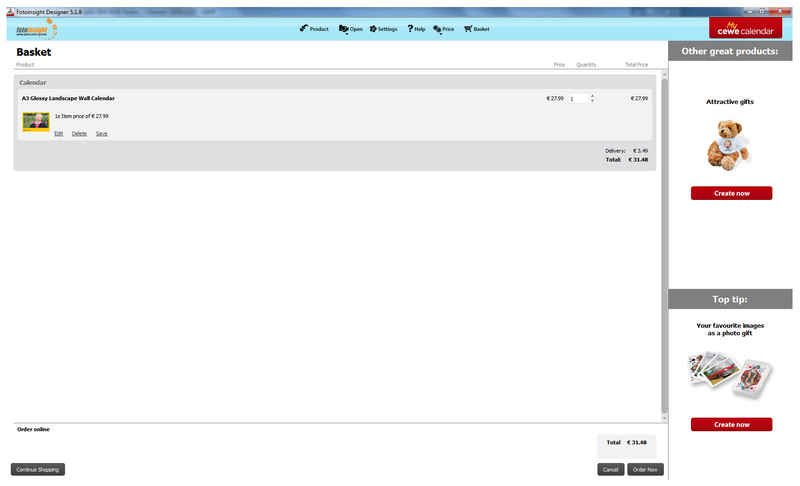 Here you can also tick the option to add bank holidays or add date-specific free text to the calendar template. Note that some smaller calendar templates may not display the bank holidays due to lack of space. 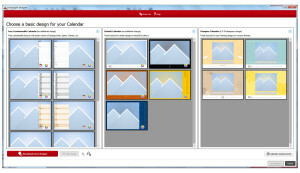 The default calendar provides one or more images per page in front of a plain background, for which there are many choices of colours. It also offers the usual calendar templates. The Designer Calendar provides designer backgrounds and calendar templates, often on specific topics, at a surcharge. 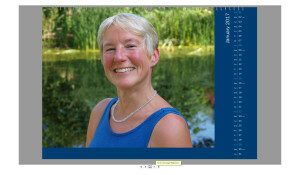 The templates of the free customisable calendar will usually assume that the image or images cover the page to the brim. 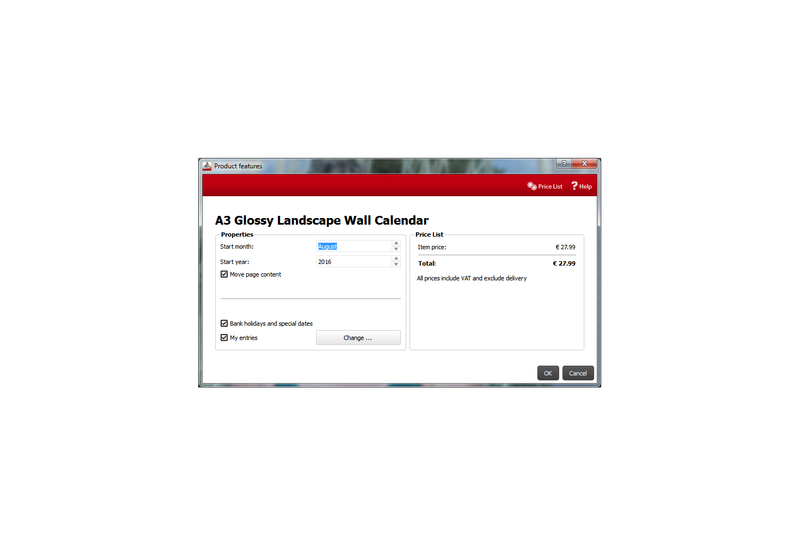 Only in these highly customisable calendars, is it possible to set images as a full page background, as is popular in photo books, by right-clicking the mouse over the picture and choosing the option in the pop-up menu. In the free customisable calendars it is also easier to add small images on top of the calendar template, for example, to show passport pictures on birthdays. The basic design sets the calendar template, background and image layout as a theme for all 13 pages of the calendar. 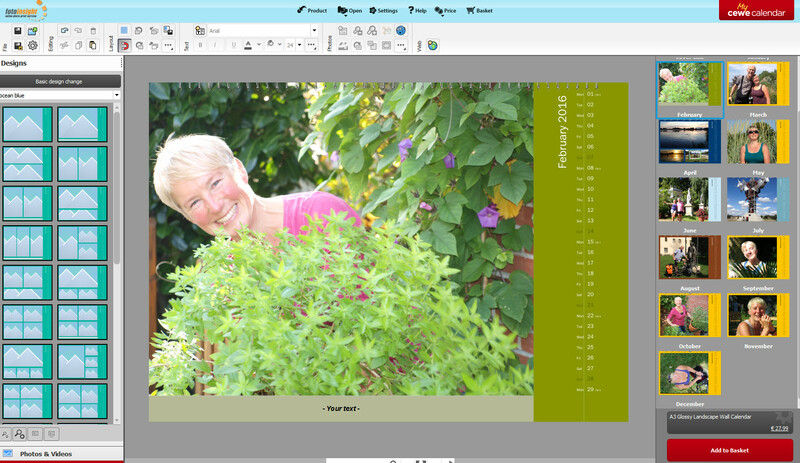 The background and image layout can be changed for the cover and each individual month at the next stage. The FotoInsight Designer app menu gives access to the choice of designs and image folders in the section on the left hand side of the interface. This section can be expanded by positioning the cursor over the separating line and then dragging it right to enlarge the section or left to give more room to the design area. 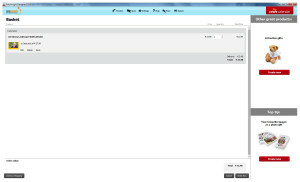 The layout section in the design menu allows to drag image templates onto individual calendar pages. The image frames can be individually adjusted, layered and text frames can be added with ease, using the icon on the top toolbar or with a right click or “Ctrl + V”. Text over images can be difficult to read, but for example a white text on top of a uniform surface, like a clear blue sky, can work well. The design grid, which can be activated from the ‘Designs’ block of the toolbar, helps to position picture or text frames. When creating a bespoke design for one month, it can be saved to use in other months. To apply a specific design to the whole year as a basic design, right click on the design template and click the option in the pop-up menu. In some calendar templates, such as those for the kitchen calendar and time planners, it is possible to insert columns in the calendar. In the headings of the columns you can then enter the names of your family or team members, so that each member has a separate area for notes, tasks and appointments. In the first row of headers write the heading for the first column, in the second line, the heading of the second column, and so on. Individual calendar pages can be changed by dragging one month (e.g. July) from the page selector (on the right hand side) onto the other month (e.g. May) with the mouse, while pressing the left button. In this case the pictures, background and design from July will appear in May and vice versa. The FotoInsight Designer app comes with a photo editor. The editor is handy to quickly post-edit pictures while creating a photo book or calendar. To save a project click on the disk icon on the “General Tools” menu on the top left hand side of the toolbar or under the header “File” (“Save File” or “Save as”). It is advisable to save projects during the design process, though FotoInsight Designer also autosaves projects as the work progresses. Already stored projects can be opened by clicking on the folder icon in the “File” section on the left hand side of the toolbar or on the header “Open” (“Open another project” or “Ctrl + O”). The latest projects which you have worked on, including auto-saved projects, are listed directly under the header “Open”, where they can opened directly. Once the photo calendar has been completed the Designer app makes it easy to order a print. Just click on the red “Add to Basket” field at the bottom right of the screen, to order one or multiple prints. It is best to save the project to make sure it will be available for later use.